As a parent, I view each day as a new day to learn. My children are constantly growing and always processing things...good and bad. This is why we love to go to the library and pick out books that re-enforce good values and character-building traits. Our library has a wealth of books that do just this and I have learned how to spot them. :) One thing that we are CONSTANTLY trying to teach Hannah is how to share. She was the only child for 22 months of her life and never had to share with a sibling. Once Jacob came along, she realized very quickly that "her" things were no longer just hers. Oh, what an awful day that was for her. But, she is learning and we are right there to help her along the way. I have discovered some cute books that have really helped us with our attempt to teach sharing and being a friend. The Sock 'n Boots books are pretty cute...perfect for this phase in our daughter's life where she is learning so much. 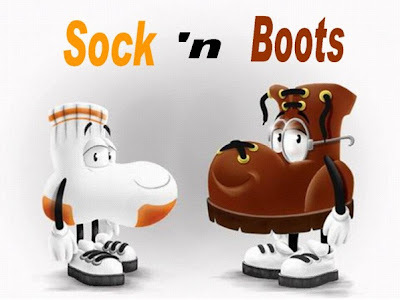 Sock 'n Boots are two friends (one is a sock and one is a boot...of course :) ) that set out on adventures together. They are best friends and help each other out whenever they can. Boots is considered the older and smarter of the two and Sock is the young, mischievous character. Poor Sock finds himself in some pretty interesting situations because of his curiosity. Our favorite of these three is the Sock 'n Boots Share. My daughter has brought this book to me to read every night before bed. She loves the part where the birds come and eat Sock's lunch...leaving him without his lunch. This gives Boots the opportunity to share. At the end of the story, I look at Hannah and ask her why we should share. She usually just smiles at me and I then fill in the blanks. I tell her because it makes people happy. Hopefully, she will take this principle and use it with her brother. Sock 'n Boots Afraid of the Dark was a good story, but Hannah just learned to sleep without a night light and I don't like to remind her of how scary the dark can be. We still read this story but I edit it to fit my liking. She loves the pictures in this book...especially the first one where there are birds and owls sleeping. :) I should also mention that there are monsters mentioned in this story which is the other reason I don't particularly care for it. 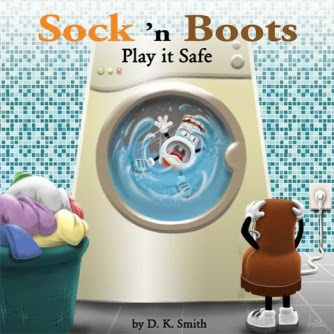 Sock 'n Boots Play It Safe focuses on how children should only play where they know it is safe. Children are curious and as Sock finds out, can get into trouble quickly if they don't play in safe places. This was a really cute story and does teach some good principles. Hannah loves this story as well and again, the pictures are great!!! This Sock 'n Boots three-story compilation book can be purchased for only $11 and is a great investment. You will grow to love and relate to the characters and their fun adventures...so will your children!! So, in my opinion...Sock 'n Boots Books are wonderful!! My daughter loves to read them daily and we always learn something new from them. I love the character building, safety focus, fun and learning that these books bring. Definitely a HUGE thumbs up from me! Leave a comment letting me know which of these stories you would love to read and who you want to give them to should you win. :) You do not have to be a blogger to enter, but you must have a valid email where you can be reached should you win. If you do not leave an email address, it must be where I can easily find it. This giveaway is open to US residents (lower 48 states only) and will end 10/5 at 11:59 pm EST. The winner will be chosen using random.org and will be notified by email. The winner will have 48 hours to respond, or another winner will be selected. 1. Like Sock 'n Boots on Facebook. 2 entries, so 2 comments. Disclaimer: I received no monetary compensation for this post. I did receive free a Sock 'n Boots book for review purposes. All quotes and stock photos are from the Sock 'n Boots website and email. All thoughts and opinions are 100% mine. I would give this set to either my grandson, or my great-nephews. Boys being boys, I think they need to have Sock n' Boot Play it Safe read to them!! Play it Safe looks like a fun book! I would read it with my 4 yo daughter. Having 5 boys myself, I would keep the books for us! And I think the play it safe one would be very appropriate! 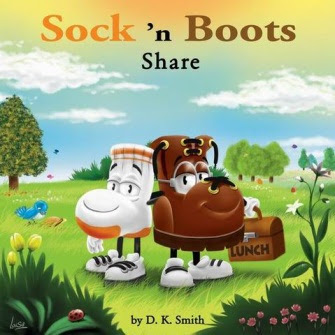 I would like to read Socks n Boots Share to my son who has a problem with the idea of sharing. i like the sock n boots afraid of the dark and i would give this to my 3 year old grandson. I'd love the "Share" book - I'd donate this to my library so a bunch of kids can read it! I would read Socks n boots share. I want to read Sock n Boots Share and these would go to my kids. I like Sock n Boots on FB (Sarah Smile). I would love Afraid of the Dark for my kids..sometimes is not easy for them to sleep in their rooms. Socks n Boots Play it Safe looks cute! This would be for my daughter. My boyz would love these books. I think they would like Sock n' Boot Play it Safe. I would like to read Sock 'n Boots Afraid Of The Dark with my daughters, which is who the book would be for! 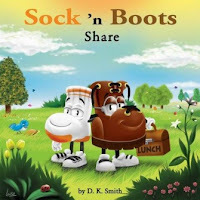 I would love the Sock n Boots share book and I would love to give it to my daughter. I would love to read play it safe and I would give the set to my daughter. I'd read Afraid of the Dark to my 2 year-old son. I would love to give me niece Socks N Boots book on sharing since we have a new addition to the family! I love the sound of the sharing book! I can't decide between Sock 'n boots play it safe or afraid of the dark but I like the play it safe cover so I'm voting for that one. I would give the books to my son to read together. 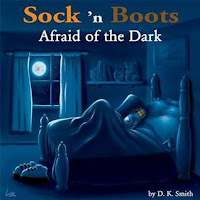 liked socknboots on facebook under the name Kyoko D.
I'd love to have Sock n Boots Afraid of the Dark. It would be a perfect book for my grandson. Would love to read Sock N Boot Share with my two little boys!! I would like socks n boots share for my nephew.